Nicholas' Touch: Kreativ Blogger Award! Thank you! 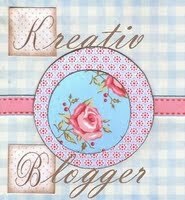 Thank you for nominating me for the Jus and Kat for nominating me for the Kreative Blogger Award! 4. Write 7 things about yourself that people may not know (BONUS: My 7 Favorite Things List follows). 7. Leave a comment on each of the blogs, letting them know they’ve been nominated. 1. I believe in Angels, now more than ever. 2. I have a tattoo of a ladybug on my lower back - which I got over 10 years ago by the way - can you say foreshadowing to this? 3. I am addicted to coke (coca cola). 4. I am terrified of losing another child. 5. I pray nightly to get a glimpse of Nicholas in my dreams. 6. I hate anyone touching my feet. 7. I really enjoy a few choice soap operas. Wish I could choose more than 7 - I love and appreciate you all! I think I will always be terrified of losing another child; that fear will never go away for me. I've accepted that. Congraulations to you and the blogs you passed this award on to. Have a great weekend. Thank you so much for nominating me! I am very touched that you chose me :) I'm also terrified of losing another child, now that I've experienced the reality of it happening to me. I just don't think I could survive it again. Thank you so much for the nomination. I loved that you clarified the addicted to Coke thing. HA.